The Cardo Scala Rider G9 goes a lot further than that bare-bones functionality, though. 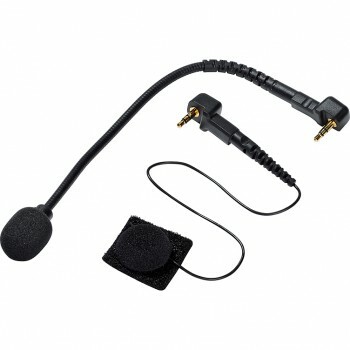 The G9 has a built-in FM radio, you can connect it to an MP3 player by cable or Bluetooth, and you can use that same Bluetooth capability to connect to your cell phone, MP3 player or GPS. You can even have two riders sharing a conference call from a phone, so you and your sweetie can both argue with the babysitter when she calls. 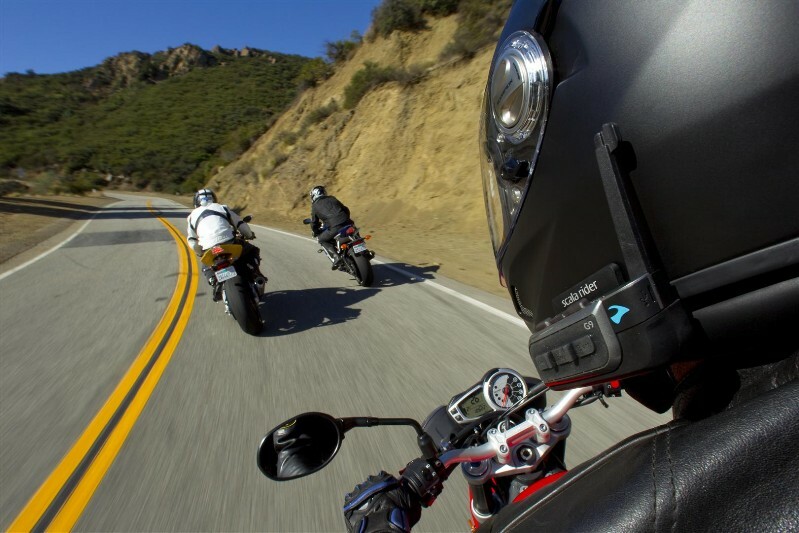 Cardo also says the G9 has pretty advanced rider-to-rider communication abilities. 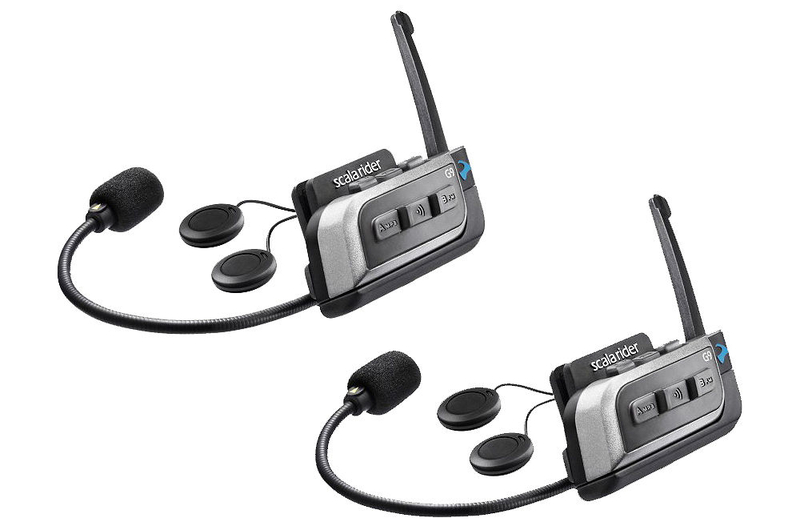 The Intercom Conference Mode is supposed to allow four-way conversations between two drivers and two passengers, three-way conversations between three separate riders and two-way rider-to-rider or rider-to-passenger conversations. You can get full duplex conversation between up to four users – everyone can talk at the same time (two riders, two passengers, four riders, etc). They also claim that it has enough power to carry communications between riders up to a mile away. But that’s not all, the G9 also has voice-activated commands programmed in; you’re supposed to be able to toggle between conversations with up to eight riders, and the Click-to-Link feature allows riders to spontaneously connect with other riders using G9 (or earlier G4) devices within range. And, in order to make it easier to pair the units, you can simply bump two G9s together, and as long as you press the right buttons, they’ll pair up. You’re also supposed to be able to connect to your riding buddies by simply speaking their name into the unit. As always, pricing varies depending where you shop, but you can find the Scala Rider G9 for sale online around the $500 mark. We picked up a pair of Scala Rider G9s in 2012 and have been testing the intercom systems when we tour together since then. We’ve also been monkeying around with the radio and MP3 options during solo rides. 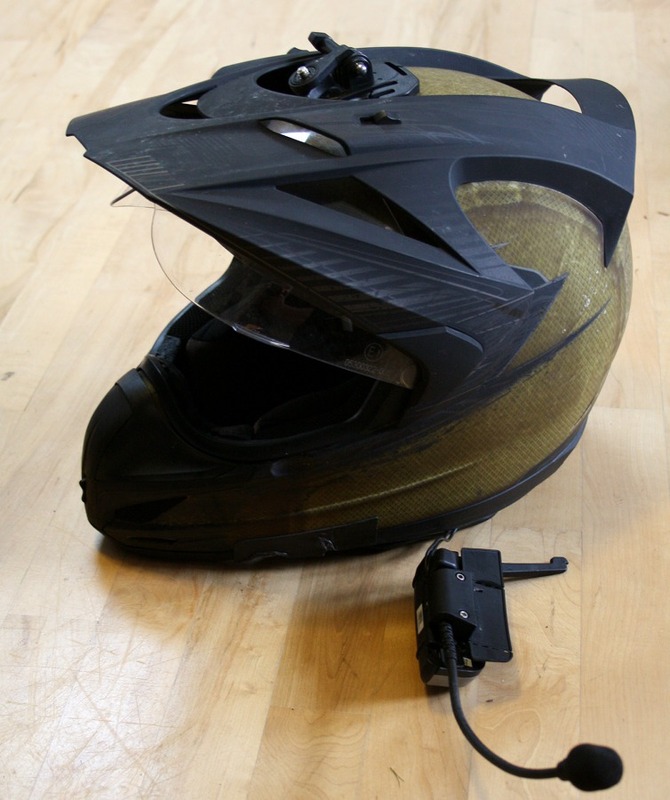 The communicator consists of two pieces; the electronic main unit, and the mount that attaches to your helmet. This part has the headphones and microphone permanently attached to it and into which the main part slides into it (thereby enabling it to be removed for charging purposes via a USB port in the back). There are two ways to attach the G9 mount to your helmet; there’s a clip you can use to attach it to your helmet’s shell, or you can use the other included bracket that glues on to your helmet (I used this method). To install the unit, you’ve got to pull apart some padding on your helmet to thread the speaker wires through and then attached the speakers (per-Velcroed) to an area by your ears. Interestingly, some helmets suited the unit better than others regarding affixing the mount and positioning the earphones. 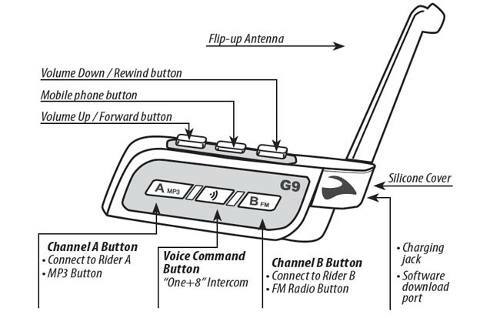 Since a picture is worth thousand words, here’s a diagram of how the G9’s buttons are set up. There are three buttons on the top, and another three on the side of the device. These work in conjunction to adjust volume, select communications channels with different riders, or toggle between your radio, MP3 player or whatever other devices you have connected. But how does all this work out in practice? Rob and I tested the units during the 2012 Fall Tour and then again this summer to find out what’s what. Rob and I made sure the units were paired, and hit the road. All seemed well at first, but once our speed picked up, since Rob and I didn’t have the speakers directly over our ears, we found it very difficult to hear each other on the G9’s speakers over wind and engine noise. Worse, one of my speakers had a distinct crackling distortion that plagued sound right from installation. And if we broke our intercom connection for any reason, we had a lot of trouble re-establishing it while riding. We eventually had to give up trying to talk when we were at speed. We did find the units quite useful for bike-to-bike contact when we were navigating through Montreal at lower speeds. Our units had built-in radios, so we were able to listen to some tunes while cruising. They were confusing to use at first, but, I got the radio figured out, thanks to hours of fidgeting with the device while riding down the 401. It helped ease the monotony, and I got to the point where I could usually make the radio do what I wanted it to do. Sound quality was a little iffy, as the speakers don’t really have any bass, but once I moved the speakers around, the music was easier to listen to. On Scala’s advice, I adjusted the speakers inside my helmet so they’d sit directly over my ears, and solved the volume issue. However, the left speaker has consistently been crackly since the first day I used it, with poor sound quality. If you don’t like the boom mic (top), you can also use the optional mic (bottom) that can be stuck to your chest or whatever. Supposedly, some touring riders like this arrangement. 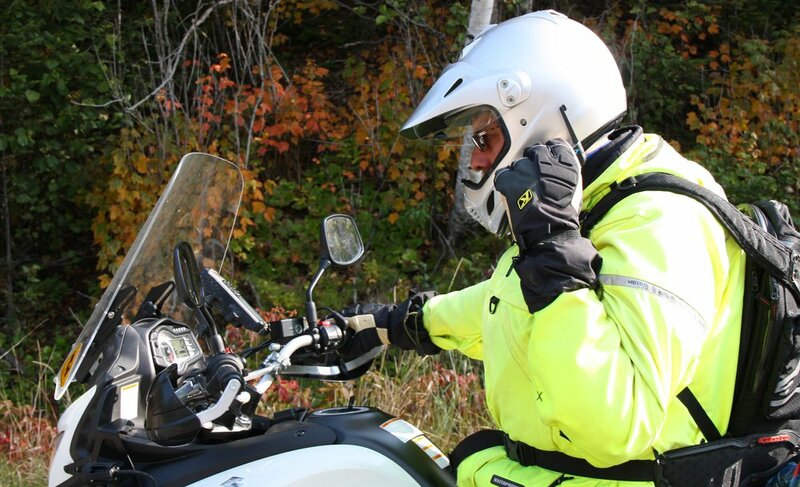 I’ve used two phones with the helmet for MP3 and communications purposes; I’ve used both the Bluetooth option, and the accessory cable for plugging another device directly into the Cardo unit. The Bluetooth is preferable. Once I started fooling around with the music options, it seemed to get trickier to connect with Rob via intercom. He found it more confusing than I did, but neither of us found the system easy to re-connect with once our intercom connection was broken. There also seems to be a delay in the initial connection that can be frustrating. Asking the unit to connect to “Rider A” seemed to be a hit-and-miss procedure; the voice-activated pairing was inconsistent at best. I also found the system switching in and out of intercom and music modes, seemingly randomly. Then I realized the issue – when I did my shoulder checks while changing lanes, the G9 was pressing against my shoulder armour, switching it between functions. I might have been able to get around this by re-positioning the unit, but alas, once it’s glued on, it’s glued on (or is it? More on that later). These units are supposed to be waterproof and dustproof, to IP67 standards. I rode through several downpours, and went through three days of trail-riding in the Ganaraska Forest, and experienced no issues. After a day of using the unit’s music functions I got a low battery warning. So, riders should expect maybe five or six hours of music before they need to recharge the units. Scala claims they’re good for 12 hours of talktime, but we didn’t have a long enough day where we could test that claim. I think most riders would easily get a day’s use of talk time out of the units, though. Scala has also come up with some Internet options for the G9; supposedly, you can use their website to meet other riders with G9s and organize rides with them. After our first tour with the G9s, we hooked our units up to my PC (the software isn’t Mac-compatible) and tinkered with it a bit. The online community idea might be cool in a place like California, where there’s a heavy concentration of motorcyclists, but in Canada, where the biker population isn’t that big, I can’t see it being very useful – especially when everybody arrived at the designated meeting point and couldn’t figure out how to make their units talk to each other. Plus, who signs into a helmet communication page to meet people? From what I’ve seen, most people already have riding buddies they know personally, or meet on websites like GTAMotorcycles. However, the computer interface also lets you do some other things, like turn the voice activation off, or adjust its sensitivity, or re-configure your intercom connection, or install firmware updates. After a bit of tweaking, Rob and I found we had much better luck with the bike-to-bike communication; we turned off the VOX option, which didn’t let us connect simply by speaking the other rider’s name into the system, but at least the radio and MP3 player wasn’t randomly turning on. However, the units still lost connection briefly, then re-connected, for no apparent reason. Pairing the units did get much easier the more we used them, especially if we were patient, but some quirks remain (for instance, we couldn’t connect the G9 to Schuberth’s SRC communicator over Channel A, but Channel B was no problem). Cardo says the systems have an effective range up to a mile – as long as you’re in a clear line of sight. 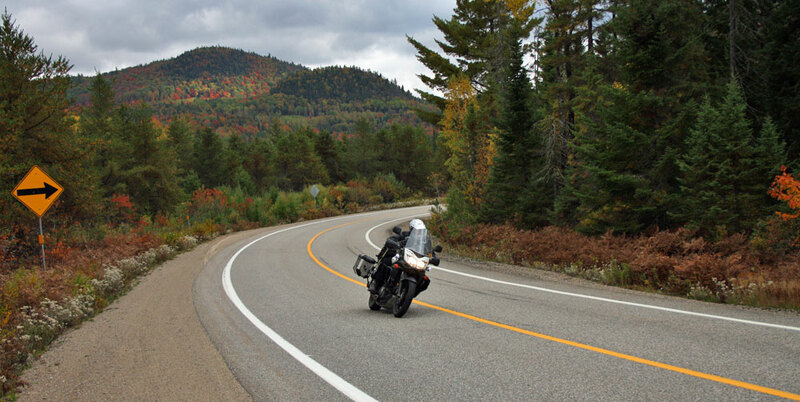 That’s fine for Bonneville or other desert riding, but in twisty woods riding, it only takes a couple of corners to seriously disrupt communication. However, if you turn off the voice activation, communication seems to be much easier to re-establish. 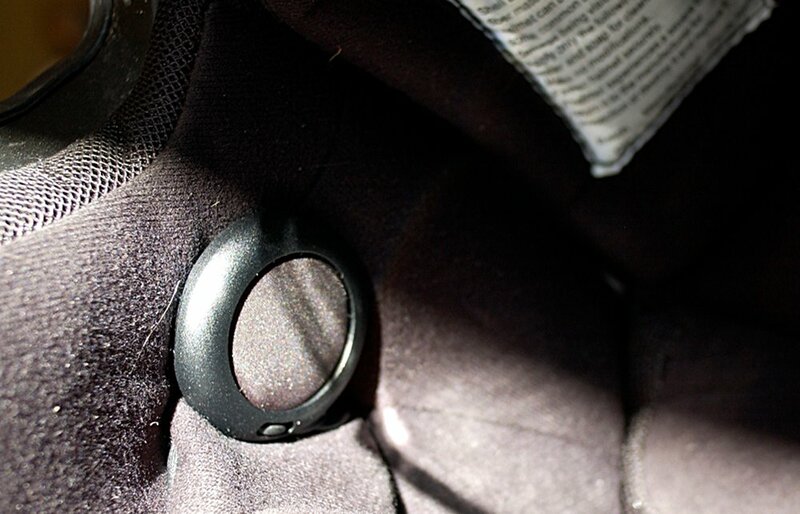 One other thing – when I glued the G9 to my helmet, the mount seemed solid. Less than a year later, it’s still glued to the helmet but the mount itself has started to delaminate. If this happened hundreds of miles from home, mid-tour, I’m not sure how you’d re-attach the unit to your helmet. Duct tape, maybe? It may sound like I’ve got a hate on for the G9, but that’s not the case; I think the user interface is not that bad, once you’ve got it figured out. The real limitation for these devices is their difficulty to connect wirelessly. I appreciate the fact they’re more than just a pair of bike-to-bike walkie-talkies, and like any gadget, they require a learning curve. In contrast, I have a Schuberth SRC communicator that’s based on the earlier G4. In many ways, I find it much easier to use. I tried the original G4 system back in 2011 but had so many issues getting it to work properly I declared myself beaten to Cardo who then sent me the updated G9 to try instead. Zac and I have been fiddling with them ever since though as rather a sad statement to how few tours we seem to do these days, we’ve probably only tried them out four or five times in that period. Over that time I have concluded that the problem with the Cardos is that they are trying to be too much. Even pairing up a couple of units can prove to be infuriating (I tried and failed to pair to an older Q2 and G4) but when you do eventually get them paired even getting the simplest of functions (i.e. the intercom) working can be a very frustrating exercise. Rob mounted his G9 further back than I did. Moving the mount further back on the helmet might make it harder to reach, but it would reduce the chance of accidentally pressing the buttons against your shoulder armour every time you do a shoulder check. Despite much pressing of buttons and speaking loudly into microphones (it’s supposed to be voice activated) we were often unable to connect, then when we’d just given up, a voice would tell me that “Rider A connected” and we could finally chat, though stopping and disconnecting meant that the reconnecting issues started all over again. 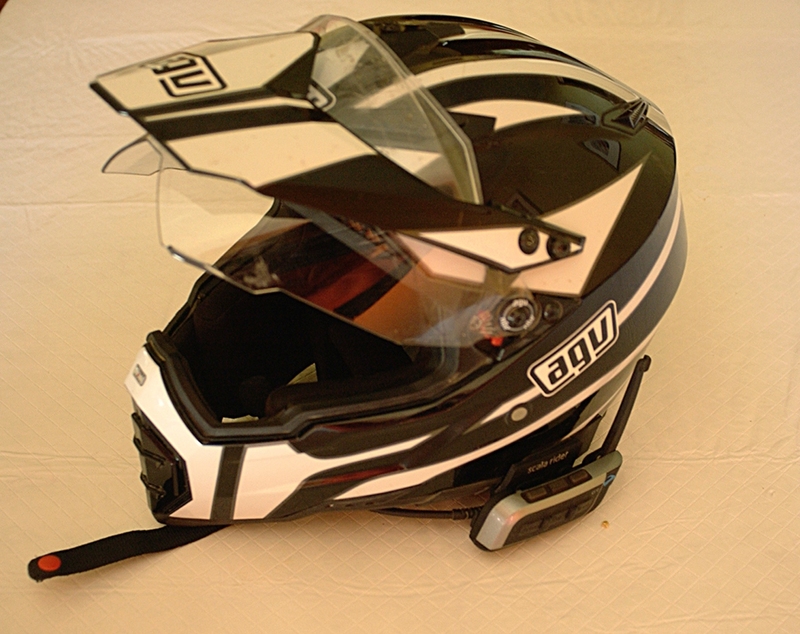 The location of the earsets in your helmet – they need to be right next to your ear, which in turn is dependent on how your helmet is designed. They work well in my current AGV lid (even with ear plugs), but can also be too close and leave me with very sore ears at the end of the day. The amount of wind noise you get – My Strom with the Madstad screen is great but the Super Tenere we had when I first tried the G4s was hopelessly noisy. I guess an excessively noisy helmet would not help either. However, having said all that, when you do eventually get it all right and you are either chatting with your buddy on where to stop to eat as you cruise through town, or to let them know that you need gas, or that boring superslab is being dulled by some righteous tunes, or you can call your partner to let them know you’ll be home in 5 minutes, it’s simply brilliant! The problem is the fact that Scala seem to be trying to jam too much functionality into a device that has to be operated blindly and with gloved fingers. I don’t know how you fix that – maybe offer the user the ability to set up the buttons to do as they want (for example I never use the radio so that function could be removed), though difficulties connecting to the other rider tend to point to operational issues rather than operator ones. If you’re thinking of buying one I would try and find a buddy who has one and try it out to see if it fits your lid and can work over your bike’s noise. He’d also be a handy person to help you navigate the unit’s inherent complexities. Still, despite its complexity and foibles, I am now a convert to the almighty communicator, though I’m not sure I can recommend the Sacla G9 due to the complexity of use and the problems we experienced. Still, after all that testing time I can almost get it to do what I actually want, so maybe I’ll keep it. For now. Cdn owned company that stands behind their product like very few others. A few yrs ago they updated my 20+yr old communicators (which I still use) with a free waterproof mic when I ordered some tiny great sounding speakers ($20) to replace the originals which were at least twice the size. They now have Bluetooth ones if you want the toys or RF ones for much more range and shared frequencies. Even mixed ones with RF and Bluetooth for the best of both. A lot better pricing as well with money back guarantees and 3yrs warranty. Not affiliated with them, but gotta give credit where due. – For $500 you would think the operational issues would have been worked out long before bringing it to market…… It sounds like it is really a work in progress and you’ve been using a beta version! I don’t see it as a sound investment, thanks so much for the frank evaluation. I have the Sena SMH10 as well, and found it relatively easy to use, and reliable, range is about 500m. The FM radio works pretty good, and the Bluetooth with Crackberry was surprisingly crisp and clear with an open face helmet. Great unit for the price. Dang. You have seriously convinced me that this unit isn’t ready for prime time. I have the Sena smh 10, limited to 4 users(riders or passengers) and no fm radio and by the sounds of it much easier to use.